Sometime in the latter half of 1911, Harry A. Franck jumped out of a box-car and crossed the Rio Grande, from Laredo. Thus began a journey, often afoot, that Harry estimated would take him 8 months. It ended up occupying four years of his life. The first leg of his Latin American epic is recorded in “Tramping Through Mexico, Guatemala, and Honduras; Being the Random Notes of an Incurable Vagabond”. He then headed south to the Canal Zone, Teddy Roosevelt’s grand experiment in socialism, and applied within the Zone police force for a position as a census taker (chronicled in “Zone Policeman 88; A Close Range Study of the Panama Canal and Its Workers”,). Since he was one of the few Americans who actually spoke Spanish, and a bevy of other languages, he was hired immediately. By June, 1912, he’d bankrolled enough money to see him through the opening phase of the work I’ll be reading for you, “Vagabonding Down the Andes; Being the Narrative of a Journey, Chiefly Afoot, From Panama to Buenos Aires”. Leaving the Zone in June of 1912, with “objections to his reemployment”, he caught a steamer and entered the South American continent at Cartagena, Colombia. Approximate 30 months later, having walked most of the length of the Inca highway, he staggered from a trek that took him over mountains and through raw jungle onto a ferry, and thence sailed into Buenos Aires, regarded as one of the most glamorous and expensive cities on earth at the time. 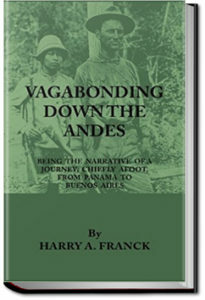 This leg of the four volume epic (which later concludes with “Working North from Patagonia; Being the Narrative of a Journey, Earned on the Way, Through Southern and Eastern South America) was the longest one, and in many respects, “Vagabonding Down the Andes” was also the most detailed.